The inaugural issue of “Gerard Henderson’s Media Watch” was published in April 1988 – over a year before the first edition of the ABC TV Media Watch program went to air. Between November 1997 and October 2015 “Gerard Henderson’s Media Watch” was published as part of The Sydney Institute Quarterly. 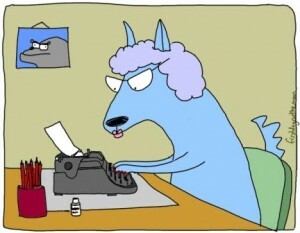 In March 2009 Gerard Henderson’s Media Watch Dog blog commenced publication. Senator Mitch Fifield, Minister for Communications and Minister for the Arts, announced this morning that Melbourne business man Joe Gersh AM has been appointed to the ABC Board as a non-executive director for a term of five years. This is a good appointment. Mr Gersh has wide-ranging experience in business – especially financial services – along with decades long involvements in community activities. (For the record, Joe Gersh is a member of The Sydney Institute’s board – as Minister Fifield mentioned in his media release today). However, it is important to remember that the ABC Board, under its chairman Justin Milne, does not run the ABC. Nor can it. Nor should it. The ABC is supposed to be run by its managing director. The choice of managing director is the Board’s most significant decision and it usually takes place every five years. The ABC managing director is the only ABC Board member not chosen by government. The problem is that successive ABC managing directors (who also carry the title of editor-in-chief) have allowed the taxpayer funded broadcaster to be controlled effectively by a collection of self-governing cliques which run the ABC’s various television, radio and online outlets. That’s how it has come to pass that the ABC is a Conservative-Free-Zone, without a conservative presenter, producer or editor for any of its prominent television, radio or online outlets. The appointment of Joe Gersh to the ABC Board, sound as it is, will not – and cannot – change the ABC’s green/left ethos. This could only be achieved by ABC management. Media Watch Dog’s Five Paws Award was inaugurated in Issue Number 26 (4 September 2009) during the time of Nancy (2004-2017). The first winner was ABC TV presenter Emma Alberici. Ms Alberici scored for remembering the Nazi-Soviet Pact of 23 August 1939 whereby Hitler and Stalin divided Eastern Europe between Germany and the Soviet Union. And for stating that the Nazi-Soviet Pact had effectively started the Second World War, since it was immediately followed by Germany’s invasion of Poland (at a time when the Soviet Union had become an ally of Germany). Over the years, the late Nancy’s Five Paws Award has become one of the world’s most prestigious gongs – rating just below the Nobel Prize and the Academy Awards. Joe Aston, of the Australian Financial Review’s “Rear Window” column, has declared that he would much prefer to win a Five Paws Award than a Walkley. Mr Aston is a past Five Paws Award recipient. He is joined today by Barry Humphries. Jackie’s co-owners travelled to Newcastle last Sunday to see the second performance of Barry Humphries’ The Man behind the Mask: Australian Tour 2018 at the city’s impressive Civic Theatre. As BH said in his opening remarks – if the Civic Theatre was in any city other than Newcastle, it surely would have been knocked down by now. All up, it was a great show by a great comic – and a triumph for a performer who was born in February 1934. The first half was stronger than the second – but no doubt this will be worked on before The Man behind the Mask arrives in the capital cities. Humour aside, perhaps the most interesting parts of the performance turned on BH’s reflections on the anti-Catholic sectarianism of his mother (whom he now concedes found her way into his Edna Everage character) and the personal account of his early adult years as an alcoholic who found refuge in Alcoholics Anonymous. Early in life, Barry Humphries presented with the conditions of narcissism and alcoholism. Thank God that one of them has been in remission for around half a century. The other lives on in The Man behind the Mask program – at a mere $20. While on the topic of The Man behind the Mask, it is notable that one of Barry Humphries’ targets in his latest show is none other than Malcolm Turnbull Esq, Prime Minister of Australia. This criticism, of two decades ago, is clearly one which BH still resents. Also, in the second act, when the comic reveals the personality on which his character Les Patterson is based, an image of Sir Les is shown. Then, superimposed on the head of the image, are other Sir Les Patterson figures. They include politicians Gough Whitlam, Lionel Murphy, Rus Hinze, Clive Palmer and – wait for it – Malcolm Turnbull. Not really the Member for Wentworth’s preferred company, to be sure. Malcolm as Sir Les. 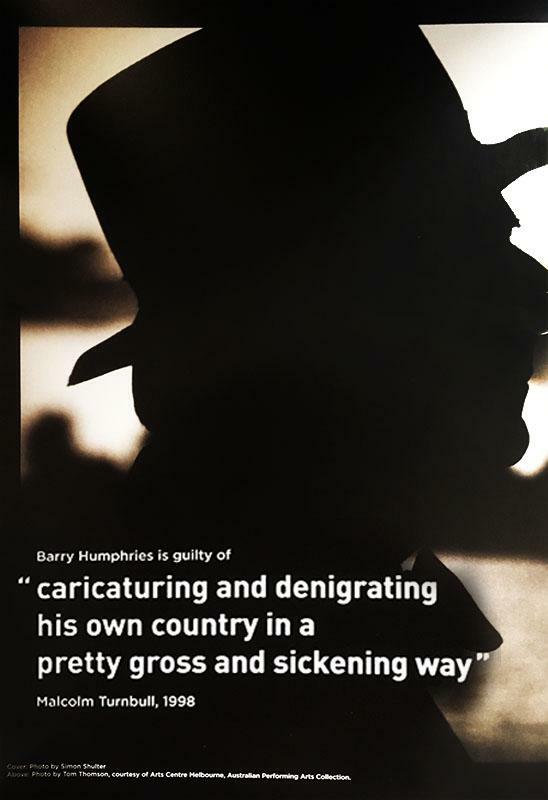 It would seem that Barry Humphries and the Prime Minister have what is euphemistically called “a history”. It is Hendo’s contention that there is a narrowing gap between what passes for news and what passes for comedy on the ABC. Charlie Pickering: It has been a big week, the budget has landed and this time it’s personal. ABC News Report: The ABC’s annual funding indexation will be frozen for three years from July next year, saving the government 84 million dollars. Charlie Pickering: An 84 million dollar cut to the ABC, I just hope Jimmy Giggle doesn’t have to get Hoot back out on the game. That’s a little more giggle and ho. But fair enough, it’s fair enough. Because budgets, they’re all about priorities. ABC News Report: There’s 48 million dollars to commemorate the 250th anniversary of Captain James Cook’s voyage to Australia. Charlie Pickering: Yes, 40 million dollars to remember the man who discovered something that was already there. No, no, no, don’t laugh, it was money well spent. Needless to say, the clappers got busy and the audience laughed loudly – about Captain James Cook and all that. Yawn. Then last night on ABC Radio 774 in Melbourne, the Drive presenter Rafael Epstein got the opportunity to interview Communications Minister Mitch Fifield. It was an opportunity to ask Senator Fifield a whole range of questions concerning the media and the arts. But your man Epstein focused on – yep, you’ve guessed it – the ABC. Epstein told the Minister that the performance of his own program was “pretty good”. Really. And quoted from Quentin Dempster, a passionate friend of the ABC. He ended up suggesting that the new ABC board member – who was not identified at the time – has “got a membership at the Institute of Public Affairs”. And that was it. Pretty funny when you think about it. Meanwhile news has just reached MWD of the latest tweet from Phillip (“I used to be a teenage communist”) Adams – continuing self-absorption and news with a splash of comedy. Here it is – where 4C is 4 Corners and LNL is Late Night Live. How funny can you get? Last Monday, The Australian carried a piece from The Sunday Times in London which it titled “Sexuality in virgin territory for intimacy-fearing millennials.” The story led with a report that “comedian Jimmy Carr lost his virginity in the same year he gave up his Catholic faith – he was 26.” The Sunday Times went on to report that “one in eight 26-year-olds told researchers they were virgins, a sharp rise from previous generations”. Apparently, if those who refused to answer the question as to whether they are virgins are added to the one-in-eight figure, the total rises to 16.4 per cent – or one in six. This according to the University of London’s Institute of Education. Well, fancy that. How does it feel to be a virgin in your 20s, 30s, 40s, 50s …? Hasn’t The Age got any ideas for news stories other than following The Sunday Times – on an issue where very few people tell the truth? Can You Bear It? Virginia Trioli: Now, what’s this Urngate? It’s even got a damn hashtag associated with it. What’s Urngate? Paul Kennedy: So that’s how they’re funding some of the [budget] promises? Virginia Trioli: That’s a tax cut. Paul Kennedy: Because that’s a lot of coffee. Journos drink a lot of coffee. Virginia Trioli: So a couple of coffees and one muffin, da da da da da! Although they might not be on the low-income earners sort of schedule anyway. But that’s how Treasury is going to take back that tax cut. Virginia Trioli: There ain’t that many journalists in there, so. Monique Bowley: Well the journalists are all saying that – isn’t it an interesting strategy to annoy the people who will be interpreting and reporting on the budget? Virginia Trioli: Well that’s pathetic if they’re saying that they’re going to be – that’s small minded that somehow their coffee will become punitive. Paul Kennedy: If they’re paying $4 for a coffee though – there will be some baristas wheeled in. Monique Bowley: Yes it won’t just be the old caterer’s blend. Virginia Trioli: What if you don’t pay 4 bucks for your urn coffee. I would riot over that. Monique Bowley: The age of entitlement is over, even for journalists. At least News Breakfasts’ co-presenters Paul Kennedy and Virginia Trioli saw the ridiculous nature of the story. But the ABC’s Monique Bowley and Fairfax Media’s Jessica Irvine thought that Australians at large would be interested in this (so-called) clamp-down on the entitlement of journalists to receive free coffee at taxpayers’ expense. Can You Bear It? Richard Glover: Does it affect your – I don’t know – patriotism, as an American, that you guys have elected him? Jennifer Egan: Don’t look at me. Um, it is very difficult to know. I mean, I think we all started out really freaking out. I mean, genuinely. I remember I was actually just finishing my last revisions on Manhattan Beach. After the election, we all thought – I shouldn’t speak for anyone else – I kept thinking he’s not actually going to take office. This simply cannot – something is going to happen between now and then. Then it didn’t. And after the Inauguration I found it impossible to work for a couple of weeks. I just thought: who knows what’s going to happen? I felt like I had to check every moment to find out if something terrible had taken place. In a way, that’s still a legitimate question. In a way, we’ve had such a pile up of unthinkable things, ranging from, you know, bad behaviour, to really worrying things, like pulling out of the Paris Accords, and, you know, possibly going to war. Um, but, of course, you know you get used to anything. And I find that I’ve sort of become better at doing my own thing amidst all of this. In terms of patriotism, I think, at least what I feel, is that you know he’s less than we are. Um, but there’s a lot of work to be done to figure out how to create more unity so that we cannot get into this situation again. I mean, a lot of people feeling very alienated and angry elected this man. And that is the fault of those who failed to meet their needs and at least talk with them about what those needs were. So I think that he’s revealed a lot to us – he is an agent of change in certain ways, like it or not. I mean, the #MeToo movement – I’m not sure that would have erupted in America if it weren’t for Donald Trump. Richard Glover: And maybe North Korea, too – we shall see. Jennifer Egan: We don’t know. How about that? To the support of audience laughter, Richard Glover questioned the patriotism of any American who voted for Donald J. Trump in the November 2016 United States presidential election. And Jennifer Egan confessed that she did not believe that Trump could win – and that, when he did, she believed that he would not be inaugurated as President. Also, Ms Egan believes if only she and her left-liberal mates had talked to potential Trump voters before the election – they would have voted for Hillary Clinton instead. It’s called delusion. Can You Bear It? One of the most challenging tasks for avid readers each Friday – after lunch, of course – is to find a John-Laws-Style-Deliberate-Mistake in MWD. Stephen Mayne was a Liberal Party staffer around a quarter of a century ago when he worked for one-time Victorian premier Jeff Kennett. Mr Kennett ceased being premier of Victoria in October 1999 – prior to which Mr Mayne had a falling out with his boss in 1994. In fact, Stephen Mayne left Mr Kennett’s employment on good terms in 1994 – and fell out with him a few years later. So there. For more from Stephen Mayne – see this week’s (hugely popular) Correspondence segment. Apart from the Budget, the main national political news this week turned on the High Court’s decision on the interpretation of Section 44 of the Constitution with respect to citizenship. As a result of this decision, four members of the House of Representatives (Susan Lamb, Justine Keay, Rebekha Sharkie and Josh Wilson) are ineligible to sit in the Parliament – as is Senator Katy Gallagher. All but Ms Sharkie are members of the Australian Labor Party. Previously four Coalition MPs and senators had suffered a similar fate. The Nationals’ Barnaby Joyce and the Liberal Party MP John Alexander successfully contested by-elections for their House of Representatives seats. The High Court decision is embarrassing for Labor leader Bill Shorten who had said constantly that, due to thorough checking, no Labor member or senator had a problem with dual citizenship. Well, that’s politics. But Fairfax Media columnist Peter FitzSimons got involved in the debate some time ago because of an analysis of class. Yep, the Red Bandannaed One – who was educated at Knox Grammar School and Sydney University (where he resided at St Andrew’s College) and played the gentleman’s game Rugby Union – these days pretends to be on the side of the toiling masses and opposes the conservatives. Yup. ; But what I find weird is that it is the Conservatives – born to run the show – who haven’t done proper vetting, while the ALP seem to have taken care of business? The Red Bandannaed One swallowed the Labor Party’s nothing-to-see-here line that it had no potential citizenship problems since it had done proper vetting of its candidates prior to the election. And then he asserted that the Coalition had problems – because, as Conservatives (with a capital “C”) they have born-to-rule mentality and believe they should run the show irrespective of dual citizenship problems. What a load of absolute tosh. It turns out that more Labor parliamentarians fell foul of Section 44 than is the case with Coalition parliamentarians. So much for Fitz’s Fake News. Apart from ABC journalist Louise (“I don’t answer difficult questions from reviewers about my book Cardinal”) Milligan, the journalist who has most pursued Cardinal George Pell in the lead-up to his trial on historic child sexual abuse matters is Lucie Morris-Marr. Ms Morris-Marr created world news in February 2016 when, following a leak (presumably from Victoria Police) she revealed in the Herald-Sun that Cardinal Pell was under investigation by Victoria Police. Like any other defendant in a criminal matter, the cardinal is entitled to the presumption of innocence unless and until proved guilty. As readers will be aware, at a recent committal hearing in Melbourne, Magistrate Belinda Wallington threw out what were reported to be half the charges against Cardinal Pell, including the most serious ones. Others were withdrawn before the committal hearing. It is expected that George Pell will stand trial at two separate trials in the Victorian County Court before the end of the year. So, there will not be much news about this case until the trials get under way. Except for any beat-ups. Enter Lucie Morris-Marr who filed a story for CNN which was printed in The National on 5 May 2018. Here’s how this piece started in The National under the heading: “Exclusive: Vatican Won’t Pay for Cardinal’s Defence”. The numerous adverts, uncovered by The National, also include bank account details of a special trust fund overseen by a law firm and an email contact address. The costs in question are in regards to a legal bill likely to run into millions of Australian dollars, as the treasurer for the Vatican faces historic sexual abuse charges in his native country. The National can confirm officially for the first time that the Vatican is not contributing to his legal bill, leaving one of the most senior figures in the Holy See to seek these funds from his supporters. Talk about a beat-up. Even for an “Exclusive”. If Ms Morris-Marr had bothered to do any research she would know that her “Exclusive” was revealed in The Catholic Weekly around a year ago. It was reported then that the Archdiocese of Sydney would not be covering Cardinal Pell’s legal costs but that a fund had been set up whereby individuals could contribute financial support. There was never a suggestion that the Vatican would provide financial support for this cause. This notice about the fund has been published in The Catholic Weekly and elsewhere for many, many months. Yet Ms Morris-Marr, who came across this in early May 2018, reckons that she has an “Exclusive”. That the fund has enabled the cardinal to engage the best legal experts for the controversial case has angered some however. They argue that it is unfair as the accusers themselves are not legally represented with their own counsel during proceedings. Ingrid Irwin, a lawyer from Ballarat who previously represented two of the accusers in the case against Dr Pell… told The National she believes the Catholic Church did not want to be seen to be paying directly for the Cardinal’s legal fight. This is an extraordinary statement – especially for a lawyer. Ms Irwin fails to appreciate that the accused in criminal cases are entitled to engage defence counsel – and appears to have overlooked the fact that juries on occasions deliver “not guilty” verdicts and that on occasions charges are dropped by prosecutors or are thrown out by magistrates and/or judges. Also, Ms Irwin seems unaware that witnesses for the prosecution can rely on the protection of the prosecution itself and/or the judge if their rights are infringed by the defence. This is the system of criminal law which prevails in Australia, Britain and elsewhere. The criminal justice system would be completely bogged down if all witnesses for the prosecution were entitled to their own legal representatives in court. Yet Ingrid Irwin and Lucie Morris-Marr do not appear to understand this. Due to normal practice in Victoria, the Victorian Magistrates Court was closed to the media when complaints were heard in the hearing of the Cardinal George Pell case. This did not stop some journalists reporting – literally – from outside the court. Writing in the Sydney Morning Herald on 6 March, Tony Wright commented about George Pell’s weight “during his footy days” – which happens to be six decades ago. Mr Wright referred to Robert Richter QC’s “faded ginger beard” and compared it to Mark Gibson SC’s “grey whiskers”. He also referred to Cardinal Pell “lumbering to his feet”. When your man Wright retires from Fairfax Media, he should be able to find a place in Women’s Weekly. And then there was Lucie Morris-Marr in The New Daily on 9 March. She referred to Cardinal Pell’s appearance with reference to the word “perhaps” and alleged that “he shuffled all week”. The intrepid reporter also wrote that there are no “beautiful Da Vinci paintings” in the Melbourne Magistrates’ Court. What an insight. Ms Morris-Marr even speculated on Cardinal Pell’s “mental health” without having spoken to – or even heard – him. This is what passes for contemporary journalism. Can You Bear It? Tony Wright did not complain about this irreverent critique. But Lucie Morris/Marr went on Twitter and alleged that she had been “bullied”. It seems that the freelance journalist regards any irreverent criticism as a manifestation of bullying. Which means that Ms Morris-Marr’s journalism cannot be criticised. Convenient, eh? Rowan Dean: Blah blah blah. Anyway, he wants to – he’s complaining about that. Ross Cameron: Okay, well, look. This – who has sent this to us? Rowan Dean: David, a loyal viewer. Ross Cameron: Well, I wanna say, David, uh. I fully – David is actually going to a very, very important question and that is: what is going to be the nature of Australia’s relationship with the People’s Republic of China? And indeed, what is going to be the relationship of the Anglosphere, the NATOsphere, with the rest of the earth? With the 1.3 billion black-haired, yellow, Chinese. And I say, David, mate, I congratulate you for taking us to the meat and three veg. Uh, because this is, to me, kind of a binary question, right? Where you can take two different options. Rowan Dean: [Interjecting] You’ve got 20 seconds to answer. Rowan Dean: Okay, can I stop you there? Rowan Dean: We’ve gotta go now. I’ve gotta have a chat to Kevin Bloody Wilson, right now. Thank God for that. And thanks also to comedian Kevin Bloody Wilson. And to Rowan Dean for pulling the plug on his co-presenter. Ross Cameron is not the Voice of China. But he is a voice for the rule of the Chinese Communist Party over the people of China. Your man Cameron reckons that the Chinese on China’s mainland are smarter than us. But, apparently, not smart enough to have achieved democracy – unlike their relatives in Taiwan. And what would Ross Cameron say if Malcolm Turnbull or Bill Shorten declared that they would be leader for life? – Like China’s president Xi Jinping. MWD just loves the Outsiders Book Club – the president of which is the witty Sky News newsreader Jaynie Seal. The talented Ms Seal is also the choreographer for the hand movements on Rowan Dean’s Outsiders Weather & Ice Age Watch segment. Outsiders is the best place on television – outside of the ABC – to hear learned discussions about books that no one has read. Commencing with The Thought of Ross Cameron on The Collective Works of Marcus Aurelius (if such collective works there be). Jaynie Seal: There you go. It’s back to you, Rowan, for your weather. How are you going with your hands and your voice? Plenty of coaching, no doubt? Rowan Dean: I’m doing my best – we’ll see how I go. But, uh, Jaynie. Listen, I hope you don’t mind, just while I’ve got you here – as president of the Outsiders Books, I just wanted to ask you who in your opinion was the most profound thinker of the 19th Century. Jaynie Seal: Ohh – that is a tricky one, I would say, Rowan. Let me think. Well, ironically enough, I’d probably agree with Ludwig Wittgenstein and pick Søren Kierkegaard. I tell you what, I say “ironically”, but I actually mean “coincidentally”, because there’s actually no irony involved. But I have just been flicking through Kierkegaard’s masterpiece On the Concept of Irony with Continual Reference to Socrates, which he wrote in 1841. Rowan Dean: Well, you mention profound thinkers. Another profound thinker, of course Alanis Morrisette, defined “irony”, or “ironic”, as “rain on your wedding day”. I’m not sure Socrates would agree entirely. But speaking of rain, it’s – as you said – time for Outsiders Weather. Now, MWD has not been inside Ms Seal’s digs. But Hendo imagines that her bedside table must be literally groaning with the weight of the books recommended by MWD in recent times. As to a new addition – well, MWD recommends that the Seal bedside table be adorned with an Australian work. Namely, David Armstrong’s 1969 tome A Materialist Theory of the Mind. The Sydney University professor was perhaps the best known member of what is termed the School of Australian Materialism. David Armstrong was one of the first philosophers to advocate functionalism as a theory of the mind and to combine this interpretation with materialism. MWD much admires David Armstrong’s metaphysical realism – and hopes that Jaynie Seal will concur. This overwhelmingly popular segment of Media Watch Dog usually works like this. Someone or other thinks it would be a you-beaut idea to write to Gerard Henderson about something or other. And Hendo, being a courteous and well-brought up kind of guy, replies. Then, hey presto, the correspondence is published in MWD – much to the delight of its avid readers. There are occasions, however, when Nancy’s (male) co-owner decides to write a polite note to someone or other – who, in turn, believes that a reply is in order. Publication in MWD invariably follows. There are, alas, some occasions where Hendo sends a polite missive but does not receive the courtesy of a reply. Nevertheless, publication of this one-sided correspondence still takes place. For the record – and in the public interest, of course. As MWD readers are aware, The Guardian Australia’s deputy editor Katharine Murphy put out the following tweet on 6 June 2014 at 4.33 pm – when that issue of MWD was “hot off the press”. Here is Ms Murphy’s tweet: “Without in any way wanting to breach anyone’s human rights or free speech – why do people write emails to Gerard Henderson?” It’s a very good question. Thankfully, not everyone follows Katharine Murphy’s wise counsel – not even Ms Murphy herself (See MWD Issue 297). As avid readers are aware, MWD reported that last Friday the ABC AM program had interviewed Stephen Mayne – who was described by Jane Norman as a “former Liberal Party staffer”. Your man Mayne was reported criticising the Liberal Party once again on something or other. Oh, yes, for allowing Christians into the party organisation in Victoria. MWD pointed out that Mr Mayne has not been a Liberal Party staffer for around a quarter of a century – and that Ms Norman did not remind ABC listeners that Stephen Mayne ran against the endorsed Liberal Party candidate at the 2016 Federal election. As readers of MWD’s hugely popular John-Laws-Style-Deliberate-Mistake Segment will be aware, MWD erred in stating that Stephen Mayne had a falling out with his boss Victorian premier Jeff Kennett when he left his employment in 1994. In fact, the falling out occurred sometime later than 1994. Mr Mayne’s second email was marked “Correspondence Not For Publication Or Quoting”. How about that? The founder of the Crikey newsletter is now demanding that no one publish or quote from his very own correspondence. Talk about a double standard. 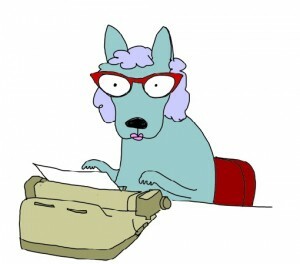 C’mon Hendo, that was a very weak lead to your Watchdog column tonight. And why oh why do you continue to make so many errors whenever you have a whack? That is totally wrong. It was only on returning to journalism, as business editor of the Herald Sun, that relations gradually deteriorated with the passage of time because Jeffrey, as you know, never much liked media criticism. That said, on your other issue, I did point out to ABC reporter Jane Norman that she may want to mention I ran against Kevin Andrews in 2016 as a pro-Turnbull moderate liberal, up against that Abbott backing DLP-imposter Kevin Andrews – a Fake Victorian Liberal if ever there was one. It was that history which actually made me a very relevant person to comment on religious right takeovers of the Victorian Liberal Party. As you know, Kevin suffered the biggest drop in primary vote of any incumbent Victorian MP in the 2016 Federal election and if he sees off the inevitable preselection challenge later this year, I may well run against him again in 2019, on the same pro-Turnbull small-l liberal platform. Finally, I note that you have once again held your Sydney Institute annual dinner at The Star, the largest pokies venue in NSW. You should be aware that Australia has the world’s highest rate of per capita gambling losses and NSW is the worst state in Australia in this regard. Therefore, respected establishment figures like you should not be lending credibility to a predatory industry which, like tobacco, relies on addiction as its core business. There are plenty of decent alternative 5 star hotels in Sydney so would you please find an different venue for the 2019 Sydney Institute dinner. I am busy now and will reply early next week. I will make the small correction. BTW, did you direct preferences in 2016 and if so to whom? Unlike the ABC, Media Watch Dog is always willing to make corrections and issue clarifications. In next week’s issue, I will record that you left Jeff Kennett’s office on good terms in 1994 – and did not fall out with the one-time Victorian premier until sometime after that. This does not detract from my point in MWD last Friday that you have not worked as a Liberal Party staffer for “around a quarter of a century”. Yet you apparently allow reporters – like Jane Norman – to present you as a “former Liberal Party staffer” to give authority to your views when you criticise the contemporary Liberal Party. I note in passing that the term “former” is frequently applied to you by journalists. You are a (i) former Liberal Party staffer, (ii) the former editor of Crikey, (iii) a former Melbourne City Councillor and so on. In the 2016 election you ran against the endorsed Liberal Party candidate as an Independent. That’s what the ballot paper said. Contrary to your assertion, you did not officially run as a “pro-Turnbull moderate liberal”. Rather, you ran as an “Independent”. Also, you put Mr Andrews last on your how-to-vote ticket behind both the Greens and the Labor Party. In view of this, it is possible that your preferences could have elected a Labor Party candidate – which would have led to the inability of Malcolm Turnbull to lead a majority Coalition government after the election. That’s not very “pro-Turnbull”. Your reference to the “Abbott backing DLP imposter Kevin Andrews” is absolute tosh. The Democratic Labor Party, which was formed out of the Labor Party split of the mid-1950s, was formally wound up in 1978 – i.e. four decades ago. The term “DLP-imposter” is meaningless. In any event, the DLP – unlike you – gave its preferences to endorsed Coalition candidates. It is a matter of record that DLP preferences saved Robert Menzies’ government in 1961 and John Gorton’s government in 1969. The DLP was not an enemy of the Liberal Party. Moreover, Tony Abbott is one of only four Liberals who have led their party to office by defeating the Australian Labor Party at the polls – the others are Robert Menzies (1949), Malcolm Fraser (1975) and John Howard (1996). Tony Abbott is hardly an enemy of the Liberal Party, whatever you might say. In view of the fact that Kevin Andrews ran against someone who presented himself as a pro-Turnbull Liberal in 2016 (i.e. you) – he did quite well. After all, Mr Andrews scored 51.7 per cent of the primary vote and 60.56 per cent after the distribution of preferences. As I recall, you declared as late as election day in 2016 that you could win the seat. It’s called delusion – you received 6.72 per cent of the primary vote and finished behind the Liberal Party, Labor and the Greens. I note that you spend a lot of time these days, at your abode in Templestowe, telling others what they SHOULD do. You maintain that The Sydney Institute should not hold its Annual Dinner at The Star in Sydney. Unlike you, I run a business and I am interested in obtaining the best venue at the best price. The Star provides an excellent facility which can seat 900 guests at a silver service dinner. The staff at The Star Event Centre (many of whom are casuals) are highly efficient and helpful and the food/drinks package is excellent. There are plenty of decent alternative 5 star hotels in Sydney so would you please find a different venue for the 2019 Sydney Institute dinner. I suggest – respectfully, of course – that you mind your own business and concentrate, say, on your own interests in Templestowe. As indicated, The Sydney Institute holds its Annual Dinner at The Star because it is the best venue. Full stop. In any event, what is the evidence to support your allegation “there are plenty of decent 5 star hotels in Sydney” that can seat around 900 guests at a sit-down dinner. I would be interested in discerning where these 5 star hotels are – just the names will do. Or did you just make this up? In which case you SHOULD do some research before telling others what they SHOULD do. You’re in good form Gerard – not many appreciate your very dry sense of humour but thanks for the chuckle. Lotsa thanks for your letter about my “very dry sense of humour”. For my part, I regarded your letter as a real hoot. For example, in your capacity as the Sage of Templestowe, you claimed that there are “plenty of decent 5 star hotels in Sydney” that can seat 900 people at a silver service dinner. But you did not name one. Could this be because you just made up the claim? As to sending me a letter headed “Correspondence Not For Publication or Quoting” – well, how funny can you get? The founder of the Crikey newsletter, which ran many a leak, is now sending out not-for-quotation missives. Well done – and Keep Morale High. Gerard Henderson – former Altar Boy and former visitor to Templestowe.